Coming to the contemporary style of furniture, you can include this rocker recliner in your space. Engage your senses with this reclining chair for added comfort and relaxation. 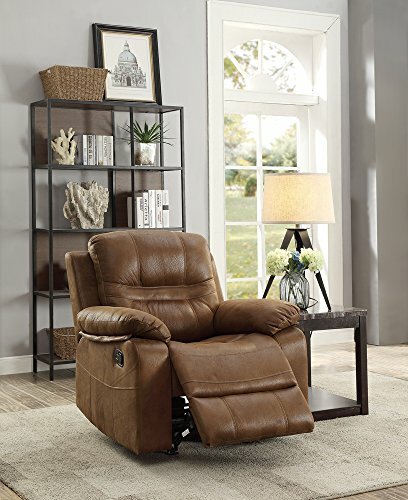 This rocker recliner is made up of leather in dark brown featuring special pillow top armrest. Upholstered in leather, its deeper plush cushioning envelopes you in comfort even when massage is off. Its wide range of recline angles accommodates a variety of body shapes, heights and leg lengths. Does not include any featured product other than this recliner. Some Assembly Will Be Required. Dimensions: 39" x 39" x 39"H Material: Breathable Leatherette Color: Dark brown Plywood base panel with solid pine frame.mechanism reclining function, fiber batting back cushion, Pocket coil seat cushion with foam encasement.